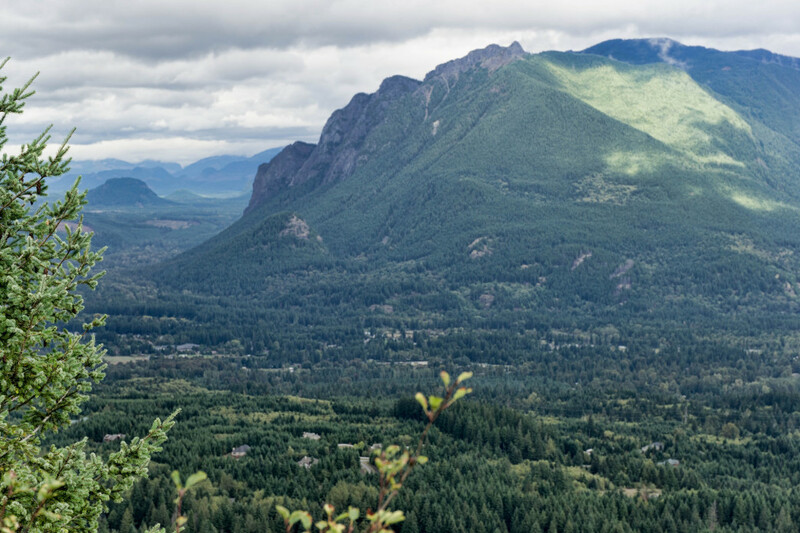 The four-mile out-and-back trail to Rattlesnake Ledge, just south of North Bend, WA, is known as a Seattle-area favorite. Less than an hour’s drive from the city, hiking up to the scenic viewpoint is mellow enough to be something that the whole family can enjoy – and the landscapes are pretty enough to be well worth everyone’s while. But if you still want to squeeze more of a workout out of this jaunt, try running it, instead. The 1160 feet of elevation gain over two miles to the ledge is sure to give your thighs a thundering wakeup. Rattlesnake Ledge is such a popular hike that many Seattleites will be familiar with the route. Which, unlike some runs whose notoriety are only known to other trail runners, means you’ll actually get some kudos when you brag about it back home!The trail begins underneath a canopy of evergreen forests. Tufts of lichens and moss adorn the trees, and ferns carpet the ground below. The ascent begins gradually enough, with well-timed switchbacks to moderate the climb. But, if you are running, there’s no getting around the fact that two miles of uninterrupted uphill is going to feel tough. Remember to bring your brawn and upbeat attitude, and just keep plodding away! Even taking it one step at a time eventually gets you there. 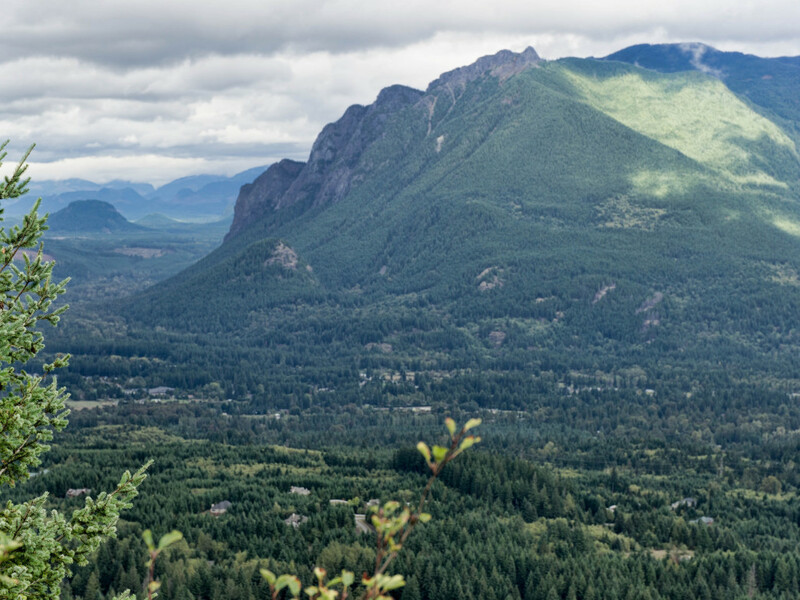 Once you reach Rattlesnake Ledge – an open, rocky area on the east ridge of Rattlesnake Mountain – the awaiting views will quickly redeem all of your grueling efforts. The Issaquah Alps surround, with the light blue waters of Rattlesnake Lake below. Just beware: the ledge can be slippery, and there are steep drop-offs all around. Keep an eye on dogs and children. And then comes the most fun part: bombing on back downhill! Mind your knees and ankles but, most of all, enjoy the ride. Once the run is done, cool down by taking a walk around Rattlesnake Lake or take a tour of the Cedar River Watershed Education Center above its shores. The Cedar River Watershed, which feeds into Rattlesnake Lake, is actually why the trail to Rattlesnake Ledge is even there: because the watershed provides 70 percent of the drinking water to the 1.4 million people living in the greater Seattle area, Seattle Public Utilities has protected the surrounding land to ensure the water remains pristine. Runners who want a lot of bang for their buck. While this is not the longest of trail runs, your legs are sure to feel the burn of the consistent uphill over the two miles to the ledge. Plus, it makes for a great short excursion out of town and into a beautiful place. Take 1-90 to exit 32 and turn right onto 436th Ave SE/Cedar Falls Road SE. The parking lot is clearly marked, about four miles down the road on the right. From the parking lot, follow a short service road on the southeast side of the lake to the trailhead. There are porta-potties, a map and information at the trailhead.